The de Paul School recently celebrated the official opening of the newly renovated main building area of the school. This initiative, funded by the generous support of donors from our Founder’s Campaign, capped off the final renovation stage of the 110-year old building. Each of the fifteen middle school classrooms and two main hallways were modernized and enhanced with new lighting, electrical and paint to provide an exciting facelift to this portion of the school. 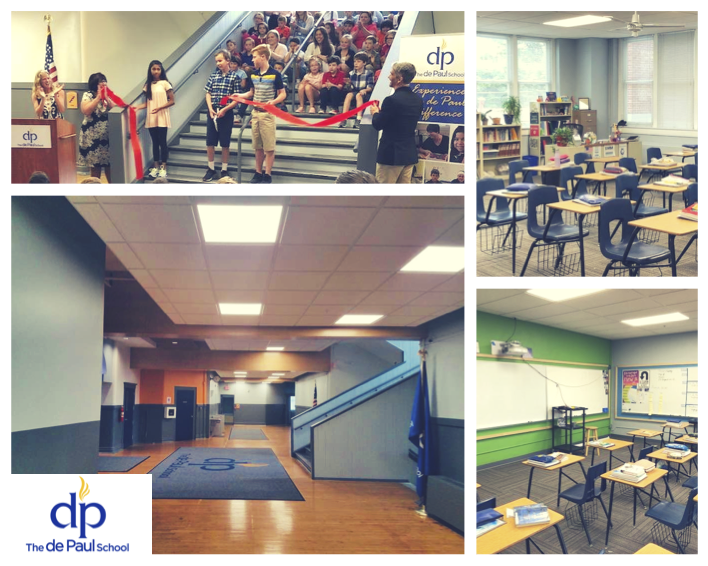 Current students, staff, faculty, alumni and friends of The de Paul School joined in the celebration and toured the newly remodeled school during a ribbon cutting ceremony that was held on August 15. A special note of thanks was extended to the wonderful partners in the $700,000 Founder’s Campaign initiative: Abel Construction Company, James Graham Brown Foundation,The Cralle Foundation, WHAS Crusade for Children, Gheens Foundation, Emma Snyder Foundation, The Dunbar Foundation, Republic Bank and JJB Hilliard Lyons. We are so grateful for your support of The de Paul School and its offerings. With the 2018-2019 school year in full swing, we’re excited to see our students and faculty experience and interact with the modern learning environment enhancements and benefit for years to come. To learn more about The de Paul School and how it can make a positive difference in your child’s learning, or to schedule a personal tour please contact 502-459-6131.